Leigh Whannell directs Logan Marshall-Green in this dystopic technophobe nightmare. A little bit David Cronenberg, a little bit Taylor/Neveldine, Leigh Whannell's Upgrade is a future-shock action horror film sure to keep fans of high intensity science fiction happy. Logan Marshall-Green is Grey Trace, a technophobic retro-gearhead in a near future world in which artificial intelligence controls even the most menial facets of daily living. When he loses his wife and the use of his legs in a suspiciously contrived car accident, he loses the will to live until he is presented with an opportunity to gain vengeance for the life he lost, but only at the cost of becoming that which he fears most. Trace is fitted with a paradigm changing digital implant which rewires his broken body to be better than new, giving him back his legs, and adding terabytes of accumulated knowledge in the form of a tiny spinal spider called STEM. At first, STEM is his savior, not only giving him back his mobility, but adding the kind of skills that make him more than a man. He is now a killing machine who'll stop at nothing to find out the who, when, why, and how of his wife's demise, no matter how many bodies he must break on the way there. Whannell's treatment of this high concept is decidedly low-brow. This is pure '70s revenge action, with a tinge of early '80s techno-paranoia to spice up the mix. Taking inspiration from – most obviously – David Cronenberg's obsession with the horrors of the human body when control is taken away from the owner, and adding in some modern action and cinematographic whiz-bang pyrotechnics, Upgrade is one intense ride. Marshall-Green is the definite lead of the film, but he is ably supported by Get Out's Betty Gabriel as Detective Cortez, the woman assigned to investigate the death of his wife, who very quickly determines that not everything is as it seems. Marshall-Green and Gabriel play an enticing game of cat and mouse as Grey Trace carves a bloody swath through the underworld with the help of STEM, and Cortez does her best to get ahead of the violence. The story isn't particularly groundbreaking, though it is certainly topical in these days when news about some AI agent – Alexa, Siri, etc... – making a horrible mistake is pretty much a weekly occurrence. What makes Upgrade special is the careful blend of ultra-violent revenge action, dystopian future aesthetics, and innovative camera work and sound that keeps the audience on edge. Whannell's visual storytelling in Upgrade is A+, with he and his cinematographer Stefan Duscio having devised a unique visual language for the action that emphasizes the disassociation between body and mind that Grey Trace experiences throughout the film. It's a fascinating trick, one that takes the viewer off guard no matter how many times it is employed. When Duscio's camera links itself to STEM's actions, rather than the world in which Trace lives, it turns the world of Upgrade into a truly unique and terrifying place, even for those nominally in control of the situation. I'm sure Upgrade intended to make a grander statement than it actually does about the encroachment of artificial intelligence, or perhaps the trust we put into the algorithms that run our lives, and it's not entirely a failure in making those points. However, it's really the action, and the gruesome aftermath from which the camera does not shy away, that is the star of the film. Logan Marshall-Green does a fine job of embodying a character at war with his own body, and Whannell's script does a wonderful job of eliminating anything not immediately related to the story and moving it forward. Upgrade is an incredibly solid science fiction thriller that shows just how much can be accomplished on a modest budget these days. Whannell, after reinvigorating low budget horror with the Saw series and contributing to the rebirth of franchise horror with that series and the ongoing Insidious saga, has shown that he's nowhere near out of ideas just yet. 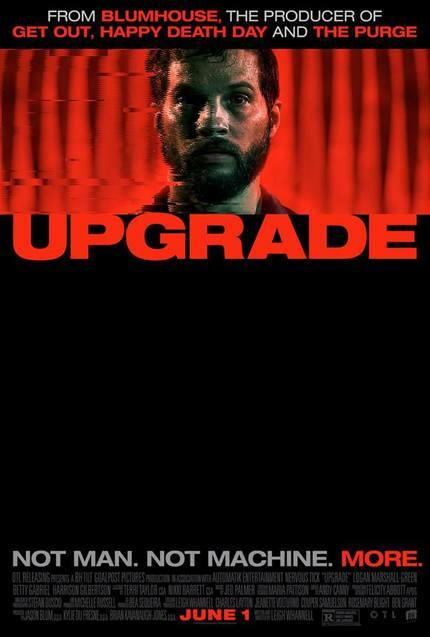 Upgrade is yet another film in the win column for this filmmaker who is destined to be named among the greats within the next decade, and it guarantees that whatever he has planned next, you can book my seat now for opening night.